Content in the sensenet Content Repository are built up of fields. Everything is represented as a content and all of content data can be accessed via fields. Field in sensenet is the atomic data accessor, however it is more than a simple property. A field describes the represented data, defines its type, domain range and it is also able to validate data. The field specifies how its data is being indexed and is also responsible for data transformations between the storage layer, file system and the index. The field is one of the most important extensibility points in sensenet. For more info on field definition and the possible properties/settings, read CTD. The content type definition specifies the type of the content and its fields. In code this is manifested in the ContentType and FieldSetting objects. The Content wraps the given Node instance (or Content Handler) and has got a Field collection. The field can access the Node object’s properties, read, write, validate, export/import them and the field also serves as the data source for the corresponding field control of the content view. When the content is created over a node the most important step is building the connections between the fields of the content and the properties of the node. The field collection of the content is created according to the content type and every field connects to a property of the node according to what’s specified in it. The DataSlot attribute receives at least 3 parameters. The first one is an id that is always 0 if the field handles a single property. The second parameter is the type definition for the storage layer - this is necessary if the field is dynamic, that is it handles a property not defined in code (content handler). The third parameter defines the accepted data types for the case when it will handle coded property. It is actually a paramarray, thus an unlimited number of types can be given. Field property bindings are created when the type system of the sensenet Content Repository is (re)started, which occurs at system startup and when a CTD is changed. If the CTD contains a field that cannot be associated to any coded property (for example when the CTD is extended with a new field but the underlying content handler is not updated), then a dynamic property will automatically be created. This property will always be stored in the database through the storage layer. The property will get the name of the field’s name or the binding name declared in the field definition. The data type of the property will be the type declared in the second (RepositoryDataType) property of the DataSlot attribute. If a field is removed from the CTD whose corresponding property was a dynamic property, the dynamic property is removed by the system. 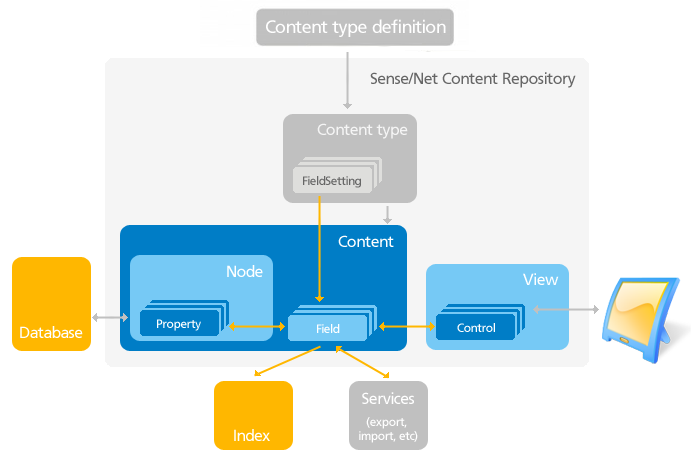 The feature of dynamic creation and removal of properties is what gives the ability to change content types in the sensenet Content Repository in runtime. If a coded property (in a content handler) exists whose name corresponds to the name of the field or the binding name, then the field will use that property. In this case the field is not responsible for storing data, but not even for converting data to the stored type. When the bindig is created the field will choose the property’s type among its own supported types, notes it and will use that type to execute any data transformations afterwards. A good ConvertFrom/ConvertTo function pair implements data conversion for all data types accepted by the field (ie. : data types that are declared in the field’s implementation), and it always converts to the bound property type from its own type and vica versa. If you need to use a new .NET data type in a content handler: implement a custom Field. 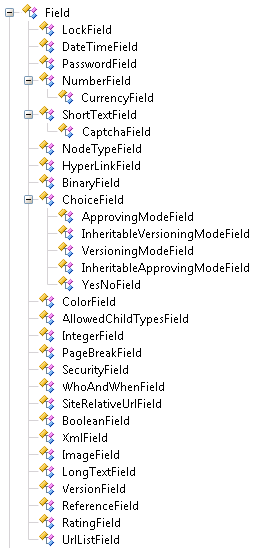 If you have a Field using the appropriate .NET type but you want to configure or validate it differently: implement a custom FieldSetting. If you want to search in a Field’s values differently: implement a custom FieldIndexHandler.